An example of a new VGOS station at the Kōke'e Park Geophysical Observatory in Hawaii, which began operating in February 2016. Earlier this year, NASA and several partners successfully tested new technology that will make it easier to measure Earth's position in space and time. The work will improve navigation of space missions and geophysical studies of Earth, agency officials said. The Feb. 5 tests showed, for the first time ever, that it's possible to link up three next-generation telescopes and perform broadband observations. Specifically, NASA is working on improvements to very long baseline interferometry (VLBI), a technique that allows multiple radio telescopes to work together simultaneously to make more precise measurements. A signal from a radio-emitting object, such as a quasar (the region around a galaxy's central supermassive black hole), is collected by several telescopes. Then, researchers calculate the distance between the telescopes by comparing the times at which the radio signal arrived at different receivers. The new system allows scientists to determine that timing more precisely, making measurements of the Earth's rotation and orientation more accurate, NASA officials said. The new network is called the VLBI Global Observing System (VGOS), and it includes several improvements compared with the old network. One improvement is the size of the dishes. At 39 to 42 feet (12 to 13 meters) wide, the new dishes are significantly smaller than the 65- to 100-foot-wide (20 to 30 m) ones used in the older network. The smaller dishes can move more quickly and do 100 observations per hour, compared with about 12 per hour for the older system. This smaller dish type is also less expensive than the older, larger ones, NASA officials said. In addition, VGOS can use broadband capability to perform more sensitive observations, thus allowing for more precise measurements with less interference from other radio sources, NASA officials said. It can work in four frequencies (bands) at the same time, allowing data-transfer rates of 8 to 16 gigabits per second (1,000 times the data-transfer rate of HDTV). The older system, by contrast, uses only two frequencies and has a data-transfer rate of 256 megabits per second, NASA officials said. NASA's VGOS dishes are at the NASA-U.S. 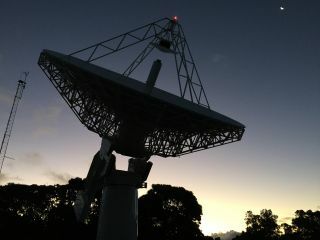 Naval Observatory VGOS station at NASA's Kōke'e Park Geophysical Observatory in Hawaii, the Goddard Geophysical and Astronomical Observatory at NASA's Goddard Space Flight Center in Maryland, and the Massachusetts Institute of Technology's Haystack Observatory. The testing didn't come easily. First, NASA and its partners had to overcome several technical problems to make sure VGOS would work correctly. The weather is different at all three sites, making it difficult to account for the effects of a portion of the upper atmosphere (the ionosphere) that interferes with radio waves. The stations also had to work amid interference from radio towers, cell towers and other radio sources. "These and other technical issues have been dealt with," NASA Goddard's Stephen Merkowitz, manager of NASA's Space Geodesy Project, said in the same statement. "We have a few more challenges down the road, but they are manageable. We now know that the new global system can be used the way it was intended." NASA did not release a date for the full VGOS implementation. The agency noted that several VLBI stations are being replaced or upgraded as a part of the transformation.